Stamping Tink: Beach Resort Sassy - My Favorite Place! Family is so important to me and having been living away from everyone for so long, when they show up in town, I want to be there! Over the last couple of weeks, I've had the greatest time spending time with four of my cousins that I haven't seen in forever! Larry and Brenda stopped by from Kentucky on their way to their camp in Canada, Robert and his family were here from Long Island, NY, Sean, Alice, and their two sweet boys from Seattle, WA, and my sweet Jerry was on leave from the navy and is on his way back to Hawaii. It was so much fun travelling down memory lane with them and talking over our times growing up. Man, were holidays hard on our parents when we all were together! I have been away from home for over 30 years so for me, any time spent with family is precious and priceless. She's worked up in some of my favorite colors - aqua and peach! When I saw this paper pack from Basic Grey, I had to have it! Love the clouds, banners and colors in these papers. 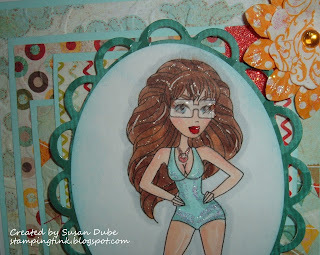 She's colored with copics and has some Diamond Glaze on her pouty lips and glasses and yep, some Stickles on that sassy suit! I used a Spellbinders die around her and edged the oval with distressed inks. I used a sketch from Sweet Sketch Wednesday. It was great fun! She was such fun to color up and now I'm back to my crafting table. Love my family and I love me some crafting! Have a great day! Beautiful work, Susan! I love her glitzy bathing suit, and you did a fantastic job on her hair. She's a beach babe for sure!! Love your style so much Susan!! The bling is beautiful too!!! love the sassy!!! Orange and teal work well together.